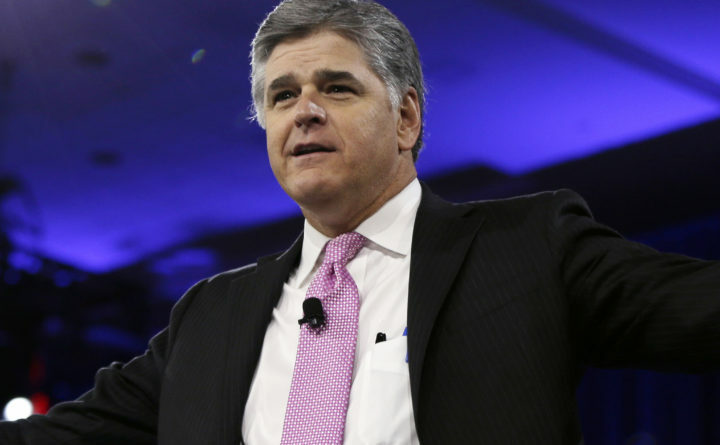 March 4, 2016 file photo of Sean Hannity of Fox News. He is the "mystery client" of Trump personal attorney Michael Cohen. President Donald Trump’s personal attorney Michael Cohen did work for Fox News commentator Sean Hannity in the last year, one of just three legal clients Cohen represented after leaving his post as a counsel for Trump’s private company in early 2017, his attorney told a federal judge Monday. Cohen’s work for Hannity was revealed during a court hearing in Manhattan Monday, according to The Associated Press, and confirmed by a source familiar with the relationship. Cohen also did legal work for the president and GOP fundraiser Elliott Broidy in the last year, his attorney told the court. Cohen was set to attend Monday’s hearing. Also on hand was adult-film star Stormy Daniels, whom Cohen secretly paid $130,000 in 2016 to keep quiet the details of an alleged sexual liaison she had with Trump. As part of the judge’s effort to resolve such requests, she asked Cohen’s lawyers to tell her Monday how many clients, and documents, might be involved in the material seized by the FBI. Earlier, Cohen’s lawyers suggested there could be thousands or millions of documents covered by attorney-client privilege. The letter from Cohen’s lawyer Todd Harrison filed Monday said agents seized “more than a dozen electronic devices and other items that include documents and data regarding topics and issues that have nothing to do with” the material sought in the search warrant. The letter said that in 2017 and 2018, Cohen had “at least 10 clients,” but seven of those were business consulting clients whose work did not involve legal advice. That procedure involves having a “taint team” – also referred to as a “filter team” of prosecutors outside the investigation review all the material and separate what is covered by the privilege. A lawyer’s communications with a client are not covered by the privilege if those discussions do not involve legal advice, or were used to further a crime or fraud. “The president objects to the government’s proposal to use a ‘taint team’ of prosecutors from the very office that is investigating this matter to conduct the initial privilege review of documents seized from the President’s personal attorney, Michael Cohen,” Trump lawyer Joanna Hendon wrote to the judge on Sunday. She added that “the president respectfully requests” that the judge issue an order barring the taint team from conducting an initial review of the seized material and require the government to turn over a copy of that material to Cohen’s lawyers. Then, the president wants the court to direct Cohen “to identify to the president all seized materials that relate to him in any way and to provide a copy of those materials to him and his counsel,” according to the letter. Any disputes about what material was or wasn’t covered by the attorney-client privilege would then be decided by a judge, under the president’s proposal. People familiar with the Cohen investigation have said he is being investigated for possible bank and wire fraud. Prosecutors are examining whether crimes were committed as part of any pattern or strategy of trying to buy the silence of people who could offer accounts that could have damaged Trump’s candidacy in 2016. In addition, the FBI is also looking into whether any fraud was committed in connection with Cohen’s ownership of taxi medallions – assets whose value has plummeted in recent years.